What do you get when you bring together a wedding gown, a ‘fashions on the field’ racing dress, a kaftan, a Chinese silk skirt panel, a debutante gown and a fancy dress costume on International Women’s Day? A window into the lives and creativity of local women from the far north, and a chance to explore their stories! Eclectic style from FNQ: Dressed to Impress exhibition, Cairns Museum 2019. Kath Moss ephemera. On loan from Mulgrave Settlers Museum. Following on from the textile training run by Dr Michael Marendy in Cairns last year, museums in the Cairns region have recently celebrated the opening of ‘Dressed to Impress’ at Cairns Museum, a collaborative exhibition that explored the wearers and makers of some of the region’s textile treasures. This is the first time the groups have worked in this way and, if the level of participation and the attendance at the opening are anything to go by, it won’t be the last! Full house – textile training in 2018. Dressed to Impress exhibition opening. Image: Travis Teske. Cairns Museum volunteers, Lorraine and Glenys at work during the workshops 2018. Dressed to Impress Exhibition opening. Image: Jackie Tam. Cairns Museum volunteers used their sewing prowess to dress the mannequins, here with exhibition designer, Michael Marzik. Image: Suzanne Gibson. Each organisation was asked to choose one garment for inclusion in the show, to undertake research into the history and provenance, and to consider how they want it to be displayed. Volunteers have contributed considerable time and work to prepare the displays. By combining their own sewing skills with the training from the workshops, they have adapted petticoats to fit the fuller dresses, made textile mounts, designed a full length slip to go under the wedding dress, padded mannequins and created supports for hats. Mulgrave Settler’s Museum shortlisted two pieces – and each was so strong we ended up including both. Volunteers contacted both dress donors and arranged for me to meet with them in Gordonvale so that we could find out more. Owner of the wedding dress, Marlene Moss reminisced about her mother-in-law, renowned local seamstress, Kath Moss. We perused the photographic album that was part of the collection and looked at Kath’s notebooks that held the measurements of women from across the region. Marlene Moss on her wedding day; one of Kath Moss’ measurement notebooks; the dress on display after hours of preparation. Carol Lavelle, former owner and wearer of the Cairns Post costume, took the dress to the nursing home to show her mother who had made it in 1956. Although her mother’s memory is fading, seeing the dress briefly stirred some recognition, a treasured moment for Carol and her family. For me, this illustrates the power of objects and the important role museums can play in reminiscence programs and community well being. Carol Lavelle: in the newspaper dress in 1956; with her mum, Callie at the nursing home (Image: Jenny Verrall); at the exhibition opening (Image: Travis Teske). Babinda contributed a dress worn by Joan Dickson, winner of the inaugural harvest queen competition in 1963. Behind this fairy tale dress, lies the story of a woman who grew up on a cane farm, trained to be a school teacher in Brisbane, made her own clothes and whose knowledge of the sugar industry was critical to her being selected the winner of the competition. Joan was part of a contingent of 14 from Babinda who traveled up to the opening by bus, turning heads when she entered with 2018 Harvest Queen, Demi Bettini. Harvest Queen Dress installation transformation: backroom preparations (Image: Suzanne Gibson); being installed by volunteers Glenys and Jenni; two Harvest Queens at the opening – Demi Bettini (2018) and Joan Dickson (1962) (Image: Travis Teske). Jenni Campbell (right) with her mother, daughter and husband at the opening. Image: Jackie Tam. Colour and craftmanship: Lynkin Lee Long’s skirt panel, c.1900s. The contribution from CADCAI, via member, Jenni Campbell, showcased a different era of clothing, and a vastly different style. Jenni’s family had kept a chest of garments belonging to her grandmother who moved to Cairns in 1906. The clothing inside is made from exquisite and ornate textiles, most likely imported from China and sewn here. The fragility of the items caused us to be cautious about which pieces to display. Jenni worked meticulously to craft her story and then attach the fabric to the textile support, a technique that Michael Marendy had demonstrated during the workshop. The kaftan that Celeste Augur donated to Cairns Museum added a pop of colour and vibrancy to the display. She bought it off the rack from a local retailer and wore it to a Fun in the Sun party during the 1970s. Free flowing and light, it is an example of the changing fashion ‘loosening up’ – rather essential during Cairns’ warmer months! Cairns’ designer, Grace Lillian Lee’s Great Barrier Reef dress. Close up of Grace’s use of metal spikes and weaving on the hat. Image: Suzanne Gibson. Celeste Augur’s kaftan is part of Cairns Museum’s collection. Cairns designer, Grace Lillian Lee, also loaned a piece for the show, providing a contemporary example of tropical inspired textile ingenuity. Her Great Barrier Reef dress mixed hand printed textiles with metal spikes suggestive of the crown of thorns, and was paired with a woven coral hat that drew on traditional Torres Strait weaving techniques. Grace’s work is now recognised nationally, and she is now working on projects that seek to create opportunities to develop indigenous voices in the textile and fashion industries. For the last few months I’ve been working on a number of projects that represent the regions diverse geography, history and communities. Rather than present a series of finished stories, this time I thought I’d showcase work that is underway. For each of the projects, the groups or organisations are undertaking something they’ve not attempted previously. None of them would be possible without the energy and enthusiasm of the various volunteers and community advocates – it’s the lifeblood of our industry. When Babinda Mill closed down in 2011, many people thought this small town would struggle to survive. They were sorely mistaken. In August last year, I was approached to provide Babinda Taskforce with advice about how to set up a museum. Motivated by the redeveloped Cairns Museum, and a desire to stimulate tourism and preserve history, this group aimed to set up displays in one of the shops on the town’s main street. But we had to start from scratch. Collage of images from Babinda, c.1919. Satchwell Family Collection. As the curatorial and design work has been developing, the Taskforce has been applying for grants and funding to support the building and fit out work. Local builders have been approached to be involved in renovating the space. While it’s been busy, the energy and enthusiasm of those involved in this project is inspiring. All of this is mixed in with a lot of good humour and local ingenuity – essential ingredients for a project like this! Normanton Railway Station is listed on the Queensland Heritage Register. Located on the edge of Normanton in the north west gulf country, the heritage listed Normanton Railway Station has a long and somewhat unusual history. Now one of the jewels in the town’s tourism crown, most visitors enjoy the small railway museum located at the station before boarding the historic Gulflander and heading out to Critters Camp or going onto Croydon. The museum collection is eclectic – it reflects the region’s pastoral and social history as well as the story of rail. Station’s Officer in Charge, Ken Fairbairn, has been keen to get assistance with the museum’s collection management for a number of years. Now, through the assistance of Queensland Rail, the MDO program is about to start a project that aims to provide cataloging and policy advice for Queensland Rails movable heritage collections, and that involves practical work and training at Normanton Railway Station Museum. In September I traveled up to Napranum, Mapoon and Weipa with historian Geoff Wharton to get an insight into the cultural heritage of the Western Cape. The main purpose of our trip was to begin discussions about developing a keeping place at Napranum in conjunction with the Shire Council. Geoff, who has a long association with Weipa and Napranum, a thorough knowledge of the region’s culture and connections with relevant community representatives, was the perfect person with whom to travel to there for the first time. Since my visit, Napranum Shire Council staff have visited a couple of different museums in the Cairns CBD with me to give them an understanding of the different types of infrastructure and displays that can be set up. We have also undertaken research into funding opportunities, and are investigating ways to integrate relevant training in community. Whilst in Weipa, Geoff also took me to the Cape York Collection, held at the Hibberd Library where he works as honorary curator. What a treat! And, what an amazing collection of cultural, technical and scientific material that provides an insight into the region’s diversity and history. As noted in my previous post, Michael Marendy’s textile training in June inspired everyone and got us focused on fashion. Apart from groups having a better understanding of how to manage, store and display textiles , one of the outcomes from his visit will be a small textile display, due to go on display early 2019. Representatives of Cairns Museum, Cairns and District Chinese Association, Mulgrave Settlers Museum and Babinda Museum have come together to start discussing which items they want to include, undertake some research and create an interpretation approach. Mulgrave Settlers Museum holds a fantastic collection of local dress maker Kath Moss’s wedding dresses, and an associated photo album. Since opening in 2017, Cairns Museum has been working tirelessly to produce a suite of exhibitions for their temporary gallery. This textile display, with a working title of “Dressed to Impress”, will be the first time the small museums of the Cairns region come together to produce a group show. Cairns Museum Manager, Suzanne Gibson, and I are also seeking to include works of some contemporary local designers including Grace Lillian Lee and Vivienne Francine to ensure there is some contrast between old and new. Stay tuned for more details. For those of you haven’t heard, Cairns Museum and has reopened. And it is FABULOUS! I’m not going to pepper this post with a hundred pictures (why not visit or check the website to see it in all it’s glory), but I can’t resist sharing just a few. Cairns School of Arts building, built in 1907, has been refurbished and modernised. You can’t help but notice the refreshed façade that now graces the corners of Lake and Shield Streets. The new annex provides space for additional galleries and a significant collections storage room, while the veranda encourages visitors to gaze out over the town and enjoy the Coral Sea breeze. Researchers can now visit the Cairns Historical Society during the wet season without sweating, and enjoy contemporary research facilities! Inside the museum you’ll find four permanent galleries and a temporary space filled with objects and stories about people and place and living in the tropics. Take the lift to the top floor and work your way down the stairs. Explore old and contemporary Cairns, or find out about the old School of Arts collection. Interactives and multimedia bring some of the displays to life. And the shop in the entrance foyer entices with clever merchandising inspired by the collection – perfect for tourists and locals alike. That’s not all that’s new. During the redevelopment process, the historical society and museum rebranded and worked tirelessly to create a suite of add ons like education, websites, Facebook and a heritage walk. In a win for Cairns, there are now four paid jobs at the museum (some part time) – a major achievement for a town that previously had only one. New volunteers are welcome and there are a sea of new faces taking advantage of their well managed volunteer program. I might be a little bit biased, of course… but it really is worth a visit to see how a labour of love (and sweat and tears) has evolved to become a contemporary, dynamic and thoughtful museum. Congratulations to all at the Cairns Museum and Historical Society team – it’s great to see you open again! 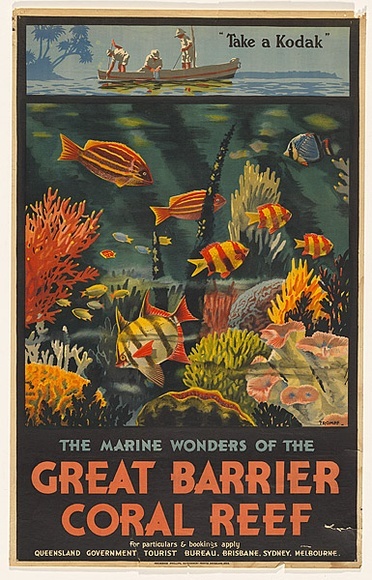 The Marine Wonders of the Great Barrier Reef, Tourism Poster, Percy Trompf, 1933. National Library of Australia. People’s desire to see beneath the surface of the sea has inspired a myriad of underwater viewing objects and inventions. From hollow reeds to Leonardo Da Vinci’s early diving apparatus, there has been a whole raft of weird and wonderful creations inspired by our fascination with coral and the reef. I’ve been exploring the way people have viewed coral recreationally on the Great Barrier Reef and around Cairns as part of my research for Cairns Museum’s new exhibitions. Drawing on material culture and academic research, I’ve found we can make some interesting observations about north Queensland’s contribution to the evolution of coral viewing. Early visitors to the reef used hand held viewing devises known as coralscopes, waterscopes or glass bottom floats. Made from aluminum and a clear Perspex or glass, these were either boxes or tubes that were held over the side of the boat and provided the user with a stable viewing lens. “The exclusion of surface turbulence meant that the scene through a waterscope was sometimes in stark contrast to the surface of the water … The waterscope thus opened up, not only fear, but a delight in the other that constituted the underwater world.” (Celmara Pocock, (2003). Romancing the Reef: history, heritage and the hyper-real. PhD thesis, James Cook University, p. 231). Queensland Museum holds one example in its collection (see below). Cairns Museum and the State Library of Queensland hold a range of photographs that illustrate people viewing coral over the side of the boat. Does anyone know of other examples in other collections around the state or country? Viewing Coral Gardens, Green Island, Cairns Historical Society. Reef viewing glass bottom boat, Green Island, c.1954. Cairns Historical Society. Green Island Underwater Observatory. Undated. Provided by Dr Justine Thorp. Glass bottom boats were another early form of coral viewing. In 1937, the Hayles family launched the worlds first glass bottom boat at Green Island. Accompanied by music, these boats were ‘allowed to drift over deep channels so that passengers can view the teeming waterlife through the glass in the bottom. '(Tourism Guide book) Adapted later in the 1940s, these vessels continue to be used on the reef today, providing access to the underwater world for those who prefer not to immerse themselves. Local entrepreneurs Lloyd Grigg and Vince Vlassof, were involved in creating another underwater viewing first for the region. In 1954, they opened the Green Island Underwater Observatory, a 10m chamber with 22 port holes, situated at the end of the jetty. Bought for 400 pounds, it was converted from an underwater diving chamber used in WW2 to erect pylons, and taken out to the island and sunk into position. A shop and residence were erected above it and coral formations bought in from other reefs to attract fish. The underwater observatory remains on the jetty but is no longer open to the public. New innovations, like the Scubadoo – an underwater scooter – and more advanced diving equipment have revolutionised the way we interact with and view the reef. But these three objects provide special insight into the innovations the region has used to make the Great Barrier Reef’s underwater gardens more accessible to visitors and enthusiasts. Stay tuned – there are many more fascinating stories being uncovered as the research for Cairns Museum’s redevelopment continues. In this age one of the challenges many community museums face is attracting new visitors. A wide range of activities such as sports, theme parks, shopping or community service all compete for potential visitors’ time and attention. Compounding this effect, people’s understanding of our collections and their meaning is diminishing. 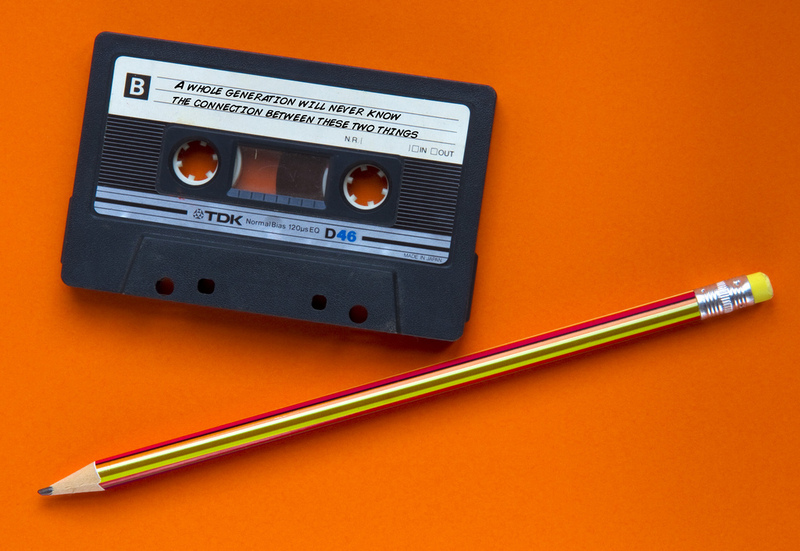 The items which were once commonplace in everyday life are now seen by many as unknown “things”, with little relevance to their understanding of the world. And to be fair to the visitor, sometimes we don’t do the best job of helping them to understand what they are seeing and why (we think) it matters. Sometimes we simply leave them alone with these unknown, uninterpreted objects to try to make sense of what it all means. Perhaps we shouldn’t be so surprised when it becomes all too hard and they don’t bother to visit. With this situation at hand, the need to produce quality exhibitions with engaging stories to make sense of our collections has never been more important. 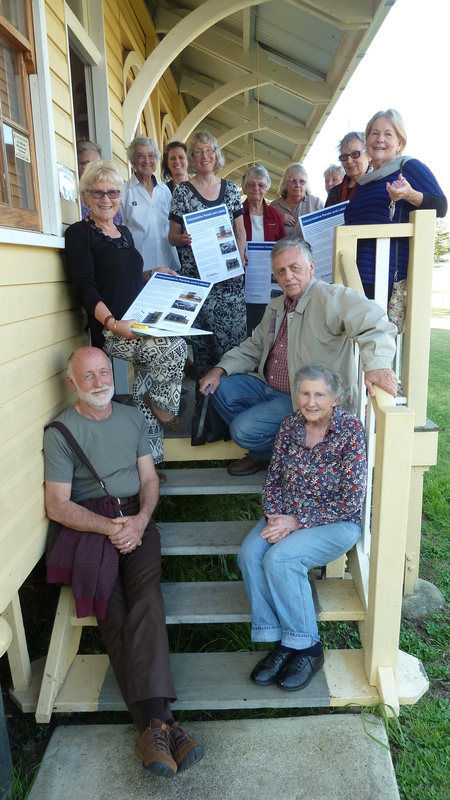 Volunteers from The Rathdowney Museum, Museum of Australian Military Intelligence, Templin Museum, Beaudesert Historical Society, Tamborine Mountain Historical Village with their finished interpretative panel exercise. With these challenges in mind, volunteers from Scenic Rim museums gathered recently at Rathdowney for an exhibition development and label production workshop. During the day, the groups explored the topics of exhibition components, concept development, structuring narrative, writing, and production methods. The afternoon saw a practical session, focusing on making simple yet professional foam core labels using a number of different techniques. After an enthusiastic afternoon brandishing Stanley knives, steel rulers and spray adhesive, the participants were well equipped with the background knowledge and skills needed to produce their own exhibition panels in-house. I can’t wait to see how they will use these skills to tell the fascinating stories from their region! The Workshop was funded by the Scenic Rim Regional Council and Arts Queensland RADF Fund. The Regional Arts Development Fund is a Queensland Government through Arts Queensland and Scenic Rim Regional Council partnership to support local arts and culture. If you would like to host a similar workshop for your museum, please contact the Museum Development Officer for your region. Ewen McPhee demonstrates display techniques at the Heritage North workshop in Gordonvale. Photo: Robyn Smith, Cairns Museum. Heritage North is an association of museums and historical societies from north and far north Queensland that meets quarterly to discuss issues affecting the region. When the organisation meets, members have the opportunity to share ideas and stories about the region’s history and their museum collections. Members work closely with the MDOs from north and far north Queensland. 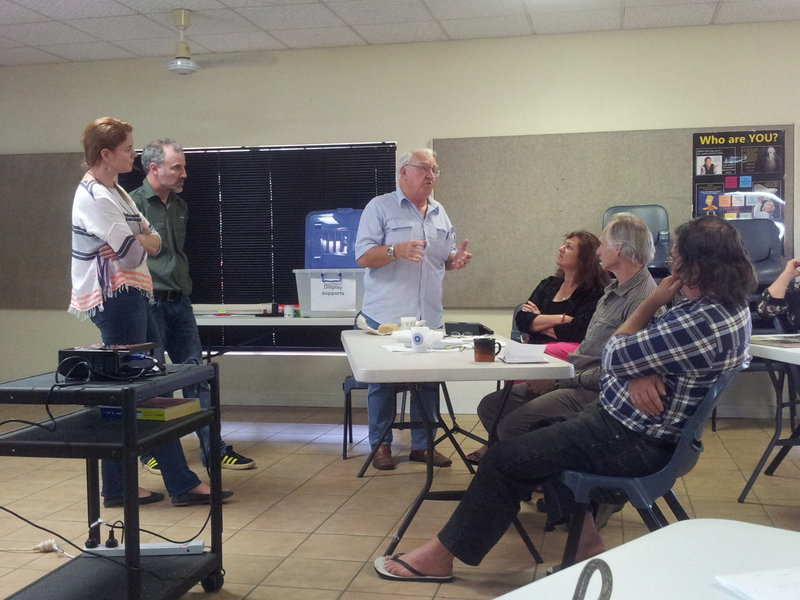 Last Saturday, Jo Wills and Ewen McPhee ran a workshop for Heritage North members at the Mulgrave Settlers Museum in Gordonvale. 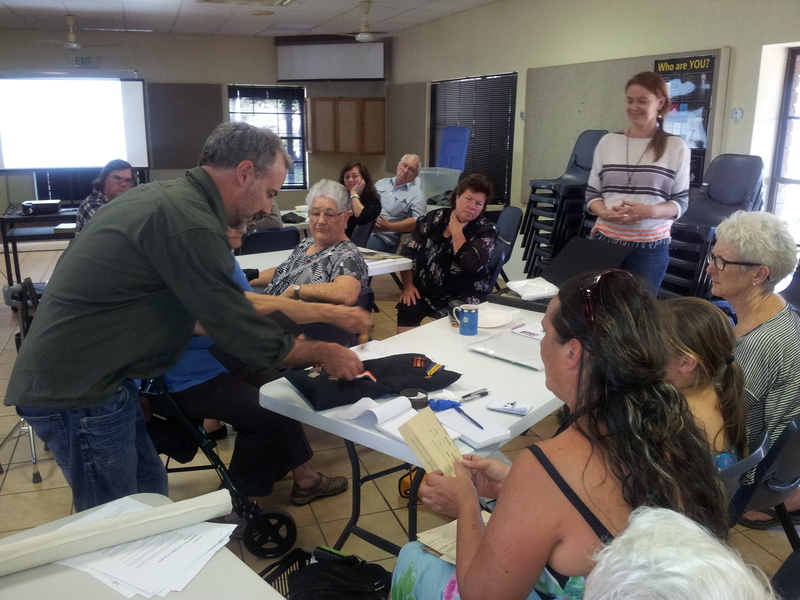 Noel Weare from the Douglas Shire Historical Society presents his object to the Heritage North Workshop. Photo: Robyn Smith, Cairns Museum. Representatives from Cairns Museum, CADCAI, El Arish Museum, Innisfail Historical Society, Loudoun House Museum, Douglas Shire Historical Society, Mareeba Historical Society, Eacham Historical Society and Mulgrave Settlers Museum bought along objects from their collections to work on as part of the workshop. Objects ranged from a walking cane, bricks, stone decorative items from CADCAI’s temple collection, to medals, a surveyor’s instrument, a branding iron and archival and photographic material. Ewen and Jo provided the group with curatorial advice regarding display planning and implementation. The focus of discussions was on object choice and stories, the value of labels, different display techniques and conservation suggestions. 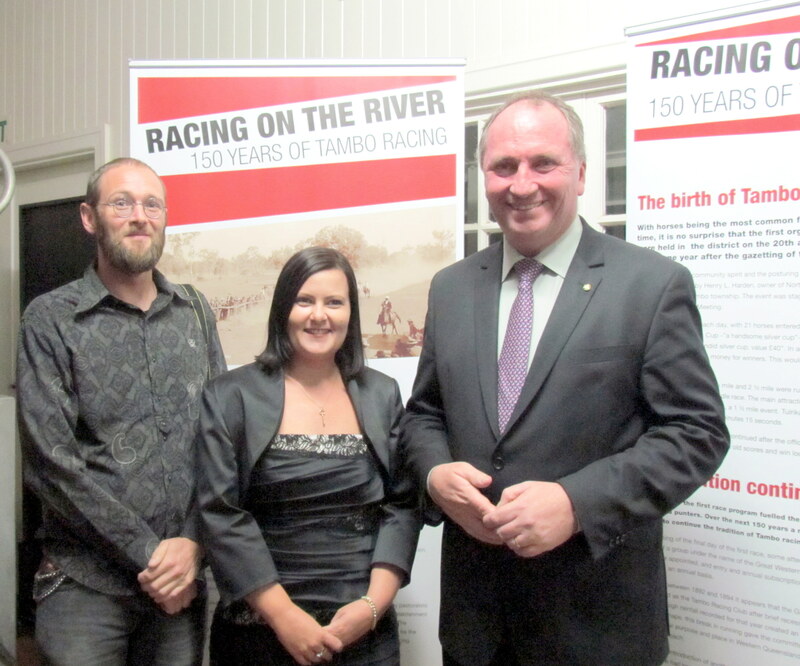 Racing on the River: Tambo backs 150 years of winners! Keen punters from Western Queensland and beyond gathered in Tambo this year for a very special race meet to mark 150 years of horse racing. In the long history of Queensland racing, Tambo lays claim to the earliest organised race day west of the Great Dividing Range. With horses being the most common form of transport at the time, it is no surprise that the first organised horse races were held in the district on the 20th and 21st of July 1864, barely one year after the gazetting of the township. No doubt fuelled by community spirit and the posturing of both riders and breeders, the first race was hosted by Henry L. Harden, owner of Northampton Downs station. The event was staged under the name of the Great Western Downs Race Meeting and saw 4 races each day, with 21 horses entered by 14 owners. Prizes included a number of silver trophies, silver spurs, and around 54 sovereigns prize money- not a small sum for the time! 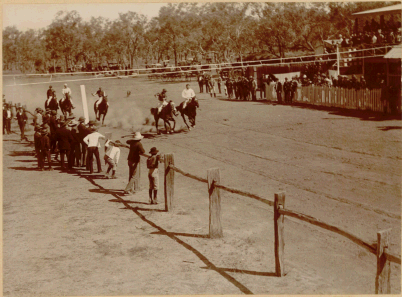 To help celebrate the event, the Central Queensland MDO worked with the Tambo & District Race Club to develop and produce Racing on the River, a travelling exhibition exploring the history of racing in the district. An exciting discovery was made during the exhibition development: the location of the first racing trophy, “The Northampton Downs Cup”. With community assistance, this holy grail of Tambo Racing history was traced back to a private collector in Toowoomba. Mrs Diana Mayall was kind enough to loan the precious piece of history for part of the exhibition. The exhibition will travel to a number of venues in the Blackall Tambo Region throughout 2014. This project was supported by funding from the Regional Arts Development Fund through Arts Queensland and Blackall Tambo Regional Council partnering to support local arts and culture. Every year, the International Council of Museums (ICOM) celebrates International Museum Day on or around the 18th of May. 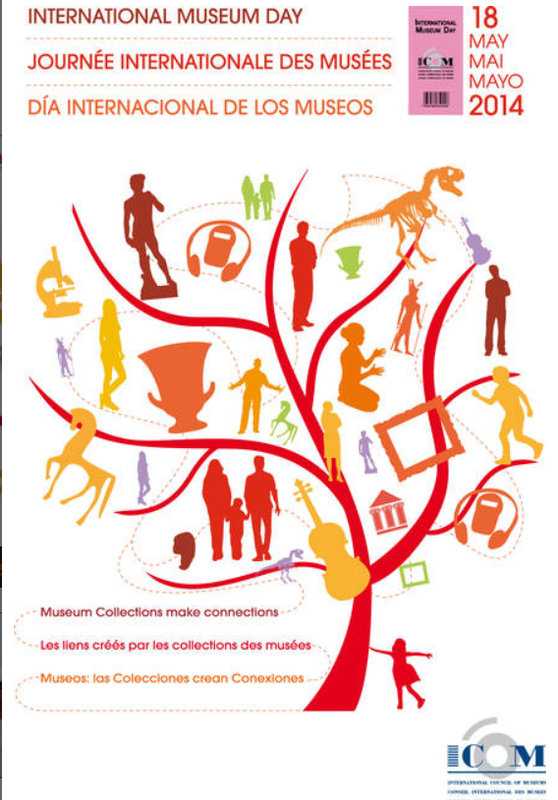 The theme for 2014 is: Museum collections make connections. This year’s theme aims to promote the way museum’s contribute to the development of society through the use of shared memory, community and cultural heritage storytelling. It reflects the desire for museums to create links between visitors and the objects in collections, and rejuvenate an understanding of the traditional methods museums use to involve their communities and stay relevant. Cairns Historical Society are in the process of re imagining displays for Cairns Museum, and working with the community to ensure their relevance. Cairns and District Chinese Association (CADCAI) are preparing to undertake an oral history project to capture community memories of the Lit Sung Goong Temple. Gordonvale’s Mulgrave Settler’s Museum is planning a new community-based competition to boost it’s public standing. 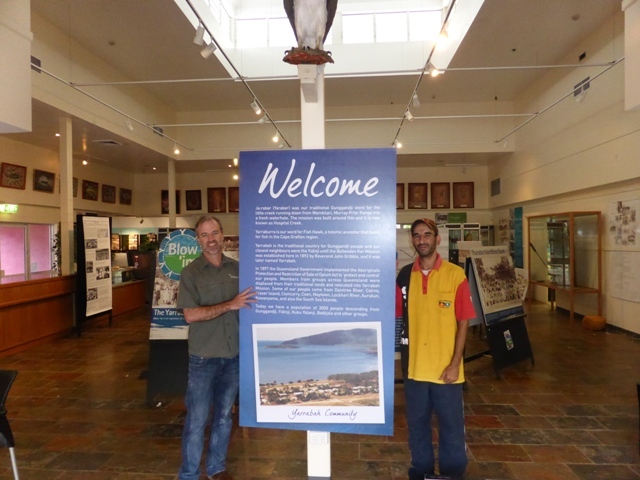 Menmuny Museum at Yarrabah is working to update and rejuvenate displays. Mapoon Aboriginal Shire Council is hoping to undertake a significance assessment of its collections. Carpentaria Shire Council is working on the interpretation of significant heritage buildings along its main street. Cape York Heritage House in Coen and James Cook Museum in Cooktown are developing displays to commemorate the 150th anniversary of Queensland Police. Ravenshoe Visitor Information Centre is opening a new Ravenshoe Heritage Gallery to showcase the region’s photographic material culture. And regional councils, museums and historical societies in Cape York, Torres Strait, the Atherton Tablelands region and the reformed Mareeba Shire and Douglas Shires are planning a range of projects to commemorate the centenary of World War One. Museums are a great industry and community to be involved in! The theme for 2015 is: Museums for a sustainable society. Ewen McPhee with Brad Higgins of Menmuny Museum during the re installation of the “Blow ‘Im Exhibition”. In mid July, MDOs Ewen McPhee and Dr Jo Wills worked with Bradley Higgins, archivist from Yarrabah’s Menmuny Museum, to install the “Blow ‘Im: The Yarrabah Brass Band Story” exhibition in time for the Yarrabah Band Festival. In just over three days, the museum space was reinvigorated, whilst maintaining the consistency of original stories and exhibition rationale. Object cases were cleaned, moved and reinstalled. Graphic panels were re-hung. Some cases were relined with calico. Object supports were also made for an original euphonium used in the first band that was donated to the Museum A new object label was also produced to accompany the display. Digital screens were installed to make Menmuny Museum’s pictorial collection more accessible to visitors, and showcase an interview with the exhibition’s original curator, Elverina Johnston. A descendant of the Kunganji tribe of the Yarrabah Aboriginal Community, Elverina curated “Blow ‘Im” in 2003. The exhibition comprises graphic text panels that explore the history of Yarrabah Brass bands as well as other Indigenous brass bands all around Queensland from 1901 to the 1970’s. 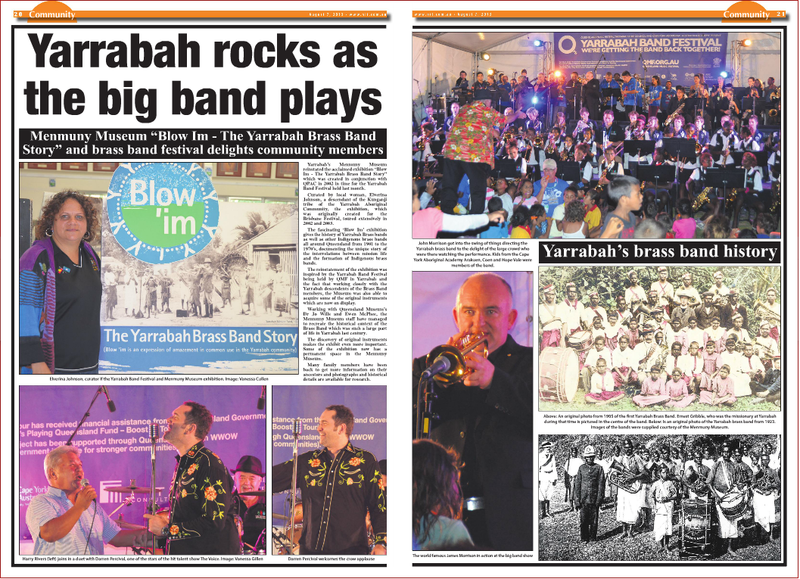 The Yarrabah Band Festival was put on by Queensland Music Festival and supported by Queensland Performing Arts. Check out the following link to find out how the project got started, and its importance to communities in the following short video clip on the ABC.